Want to be notified of new releases in konkor/obmin? OBMIN One-Click File Sharing Solution for your home network and worldwide. One-time donation via PayPal or Patron. Please, consider to support the project and make it better! Top 5 Supporters could be here with your name or logo and reference. Also the one top will be placed in GUI like 'Sponsored by ...' while there's no one real sponsor! Obmin has convenient user-friendly systray applets for many Desktop Environments like Gnome Shell, Unity, KDE, Mate, LXDE, XFCE, Cinnamon, Pantheon, Budgie DE through the obmin-indicator and Gnome Obmin Extension. Easy setup just choose file(s) locations and click Obmin on. Doesn't require any special client side installation. HTTP(S) transfer protocol available everywhere Linux, OSX, Windows, Android, iOS so. Content filters: symbolic links, backups, hidden files. Logging of detailed server connections information. Real-time monitor of incoming connections and traffic. Various Linux Desktop Environments and distributions. 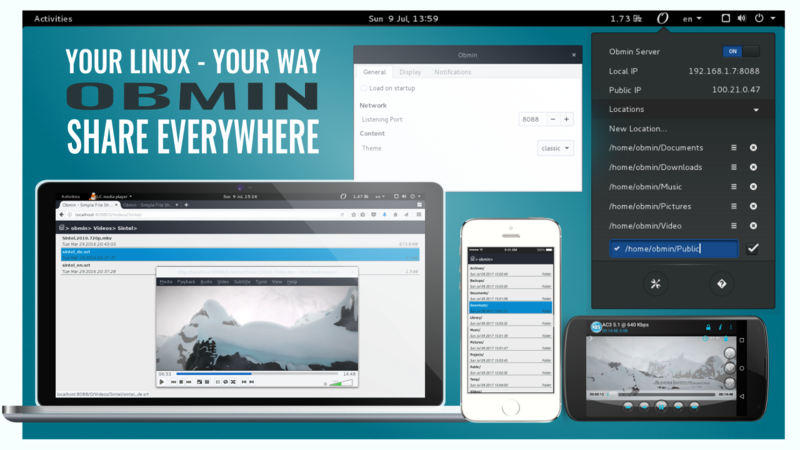 Obmin extensions like compressor, slideshow, playlist generator. Real-time video streamer with build-in remuxing and encoding. Online service to enhance obmin connectivity (need donations). Test it on your favorite Linux distribution. Contribute with an idea, graphical content, translation or code an issue. Make donation to the project. I like completely open-source projects. It's why I picked GPLv3 license for my open projects. I think only such license could protect Desktop Users from Business Users. Maybe I'm a dreamer and want to believe in the pure projects but the reality is most projects and FOS organizations are sponsored by big business and founded by them. But real life is a hard thing and very complicated by many circumstances. I'm not young and all we have it's our life (time) and where we'll be tomorrow. Life is hard. I'd like it to work on my projects productively which want a lot of time and affords. Now I want get your support to have ability to support and develop projects. One-time donation via PayPal EURO, PayPal USD or Patron where you can choose a custom pledge. Contact to the author here. Behind the development for the Linux Desktop are ordinary people who spend a lot of time and their own resources to make the Linux Desktop better. Thank you for your contributions!